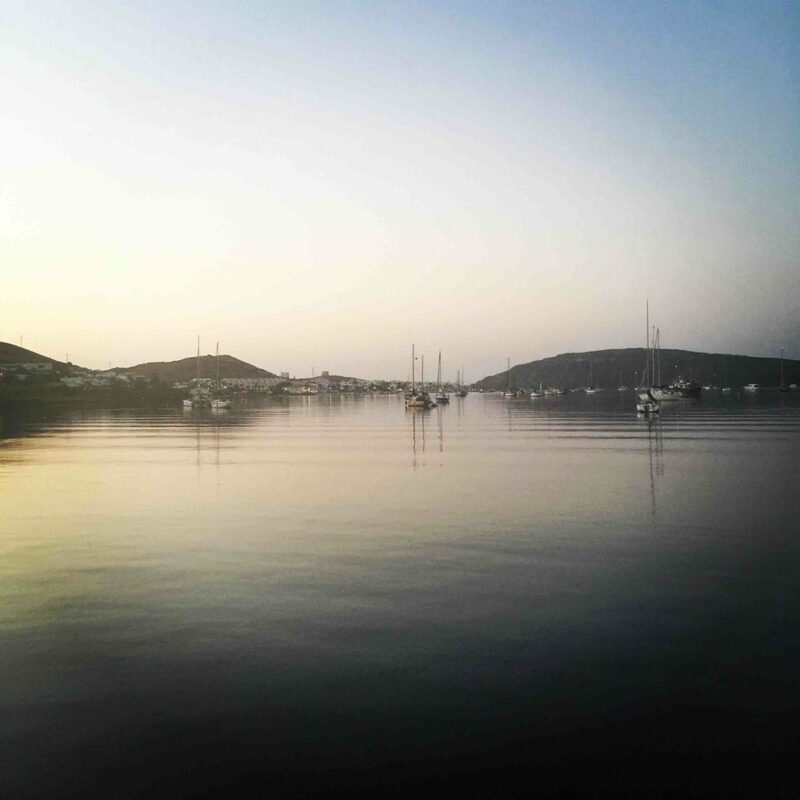 The last days in the Balearics – in Spain even – we spent in Fornells, Menorca. First we filled up with water in Ciutadella. The charge was €6 for unlimited water and a 2 hour stay, which meant we could give the entire boat a good wash and still had time to dump our rubbish and walk the dog. 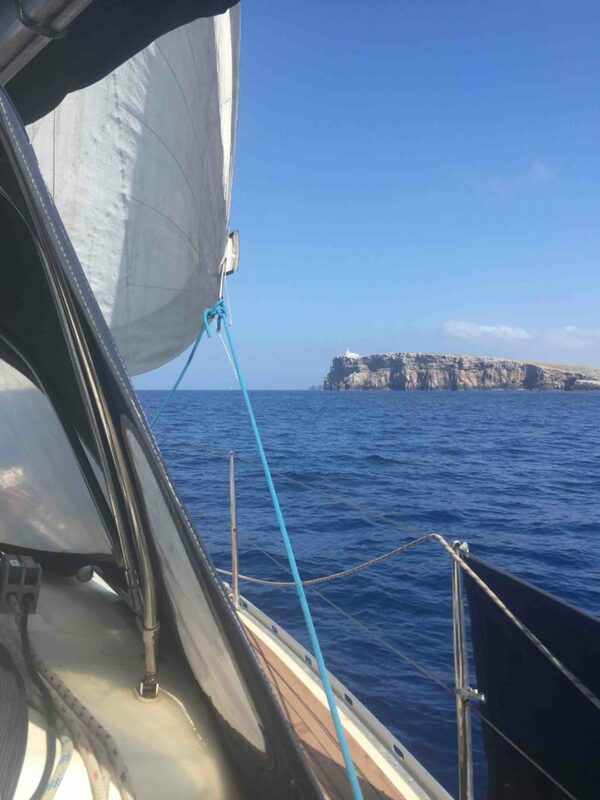 Then we sailed in very calm winds from Cala Santandria in the West to the large bay of Fornells in the North of Menorca. 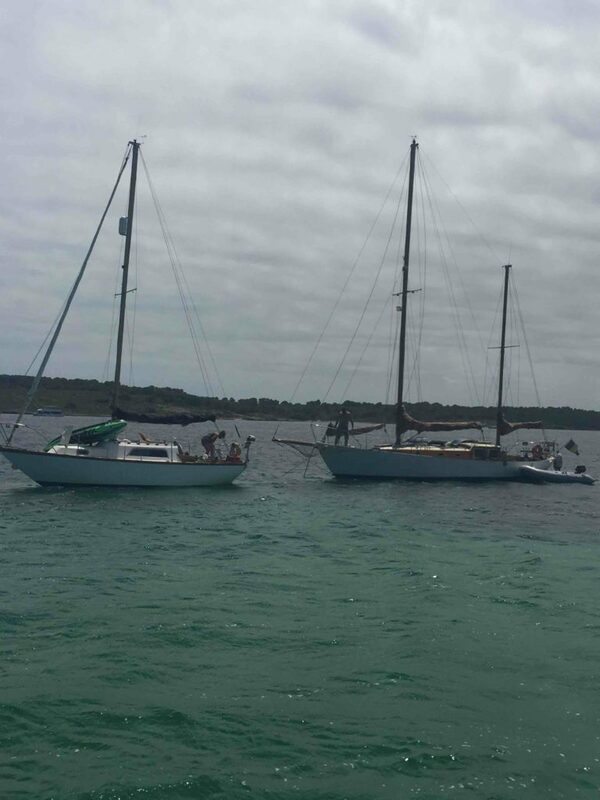 On arrival in Fornells we engined past Susan who was already anchored in a small sandy patch in front of the town center. There were larger anchorages further in the bay so we tried our luck there. It was not easy to find the right depth though: it went very quickly from quite deep (10+ meter) to shallow (less than 3 meter). After making another round in the bay we decided to dropped the anchor in 4 meter for now, and we could see the next day if space had opened up around the sandy patch where Susan was anchored. This was indeed the case, so we decided to move. We dropped quite close to the rocky shore but the anchor held beautifully in the sand. For the next few days there was quite a bit of wind forecast so it was important to keep an eye on our own position and the boats around us. As the anchorage was relatively small boats tended to anchor quite close to each other. A Spanish motorboat was only a few meters away from us. We made eye contact and told them it was not a bad idea to put out a little bit more anchor chain to be safer when the wind was going to pick up in the next few hours, and also to be a little bit further away from us. They did, and then they promptly left their boat for a coffee ashore. While the motorboat crew were out, an official from the marina approached us in a dinghy to warn us about the upcoming wind. They were also asking about the motorboat. We told them both our boat and the motorboat had about 30 meters of chain out and were well set. The official was still a little bit concerned and checked the anchors with a kind of bucket with a glass bottom. Later another official from Ports IB (a public network of ports in the Balearics) came to warn us too. We were very impressed with this service; we were also a little bit worried the reason they did this was because many boats had dragged onto the nearby rocks. The wind was not as bad as we expected but at some point we saw Susan’s boat getting very close to a neighbouring ketch. She had been chatting to the owner earlier that day and he told her he was going ashore to work, so she knew there was nobody on board. 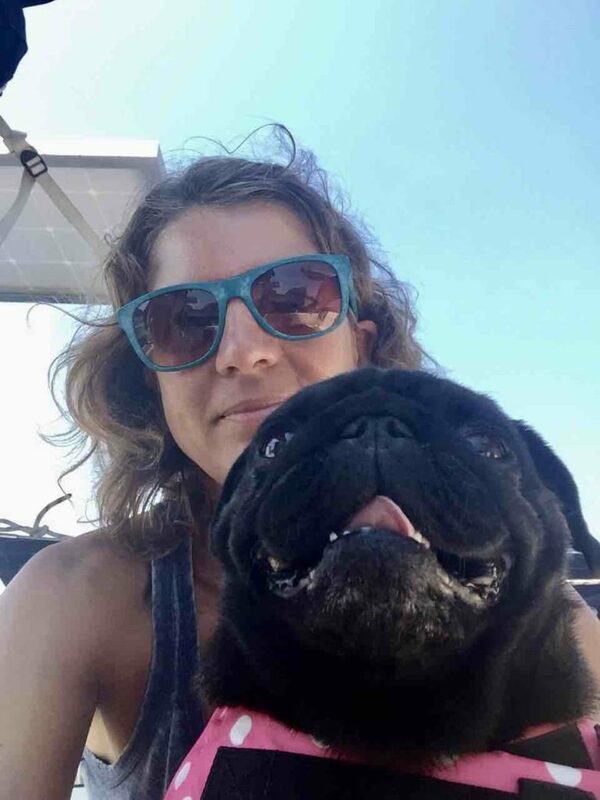 His solar panel had come loose so Susan was trying to come alongside to climb on board. As soon as we saw what was going on, Jon went into our dinghy to help. He managed to get on board to tie on the solar panel and while doing so we all realised the boat must be dragging because it had moved from alongside Susan’s boat to behind it. There was a spare anchor on deck so Jon dropped it from the bow to stop the dragging. A few hours later the owner returned. He was glad we had saved his panel and stopped his boat from dragging. The motorboat crew also returned, seemingly unconcerned about the proximity of their boat to the rocks behind it, and soon after they left the anchorage. Jon had to return to the dentist in Mahon to finish the work on his broken filling. There was a very straightforward busservice from Fornells to Mahon: €3.50 for a 1-hour journey. I decided to come along to do a bit more sightseeing in Mahon. While Jon was being tortured in the dentist chair, I walked around the old town and the quays. 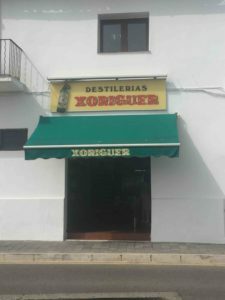 Here I visited the gin distillery which was quite disappointing. 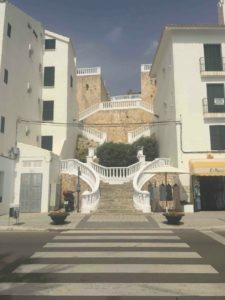 According to TripAdvisor reviews it was one of the top attractions in Mahon. In reality it was a gift-shop with windows to view the distillery itself. There was no tour of the distillery and very little information about the process itself. I could see there was the option to sample the different gins, but at 10 o’clock in the morning I didn’t really fancy that. After walking around for an hour in the increasing heat I was happy to meet Jon outside the dentist office. The right-hand side of Jon’s face was numb from the anaesthetic and he was told he could not eat or drink for the next few hours. I felt I had seen most of the town by now, so we decided to head back to Fornells. 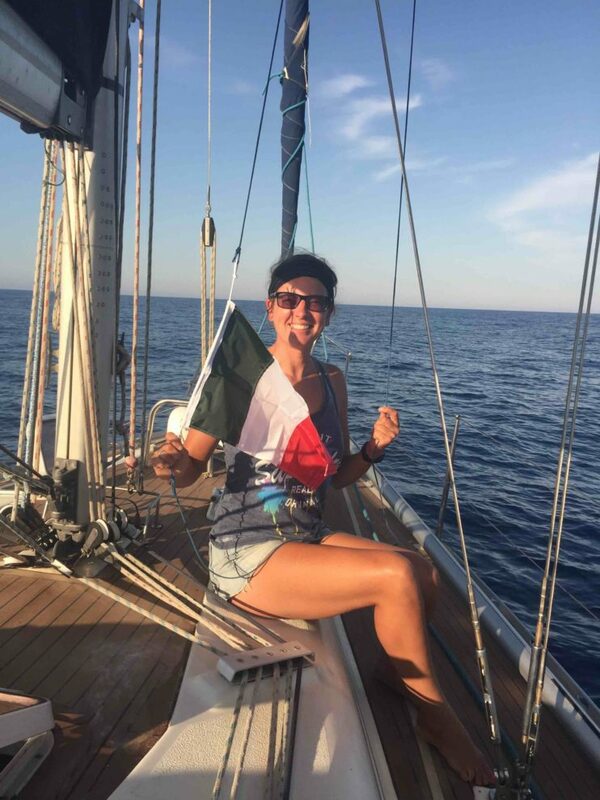 The good news was that the tooth did not require a root canal so no follow-up appointment was necessary, which meant we could start planning our crossing to Sardinia. It would take around 48 hours to get from Menorca to Sardinia. We left around lunchtime so we would most likely arrive on the other side in daylight. 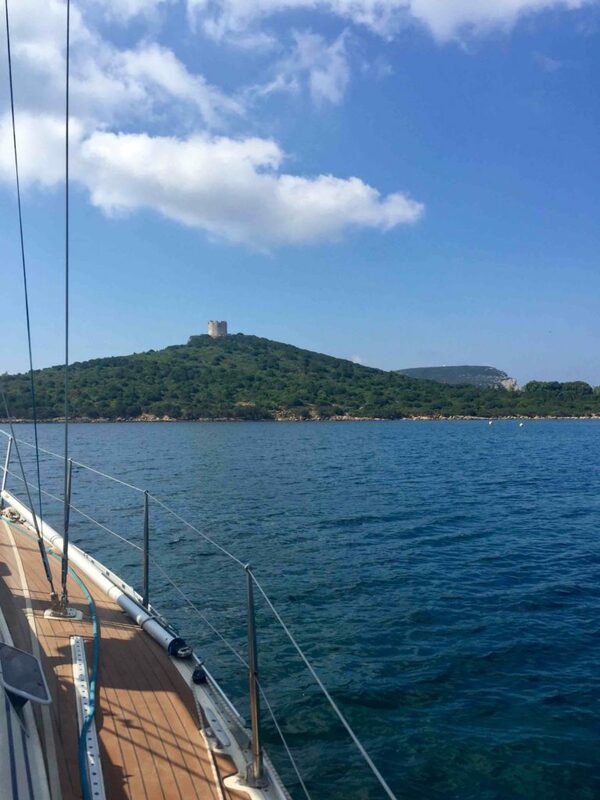 For most of the 2 days the forecast was light winds, up to a maximum of around 10 knots. The first few hours there was a bit of swell but that eased off quickly. Day 1 we managed to sail about 3 hours, but at a slow pace (2 to 3 knots). Throughout the night we continued alternating sailing with motoring. The good thing was that it was so calm that we both managed to sleep quite well while the other was on watch. 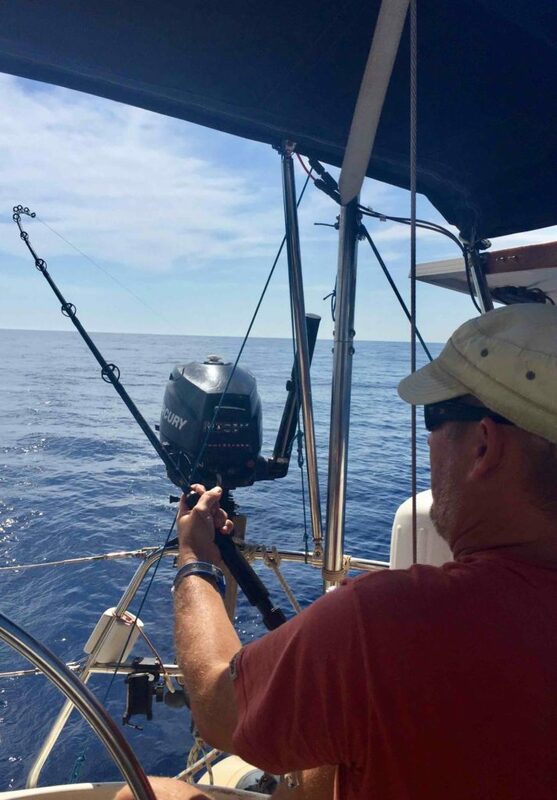 Jon noticed on his first watch (9pm to midnight) that our navigation lights weren’t working. He turned on the tricolor instead but that also gave up after an hour. This was not a big issue though: we had our steaming light and stern light on so we would be visible and in any case there was very little traffic. The entire next morning, from 5am to 2.30 pm, we were on the sails going between 4 and 5 knots. At 4.15 pm Jon was talking to Susan on the VHF when he suddenly ran up the steps into the cockpit, leaving me to explain to Susan that he had to go because the fishing reel had suddenly sprang into action. He hadn’t caught any fish yet this whole season so it was very exciting to see something finally had gotten on the hook. It was a heavy fish and it was fighting hard for its life. Very slowly Jon reeled it in. I had gotten all the necessary equipment to get it on board (gaff, bucket, knife etc.) and was all set with the GoPro and my phone to record the catch of this beast. In the end it took 1 hour and 15 minutes to get the fish close to the boat. Then: disaster struck! It managed to get itself off the hook just a few meters from our stern. It was disappointing that we never even got to see it so we don’t know what kind of fish it was and how big it was. From the force on the rod Jon thinks it must have been a huge one. Better luck next time! Big fish on the line! The second night was uneventful. We were still sailing for short times but mostly motoring. A few hours after daylight we could see the coast of Sardinia appear in the distance. 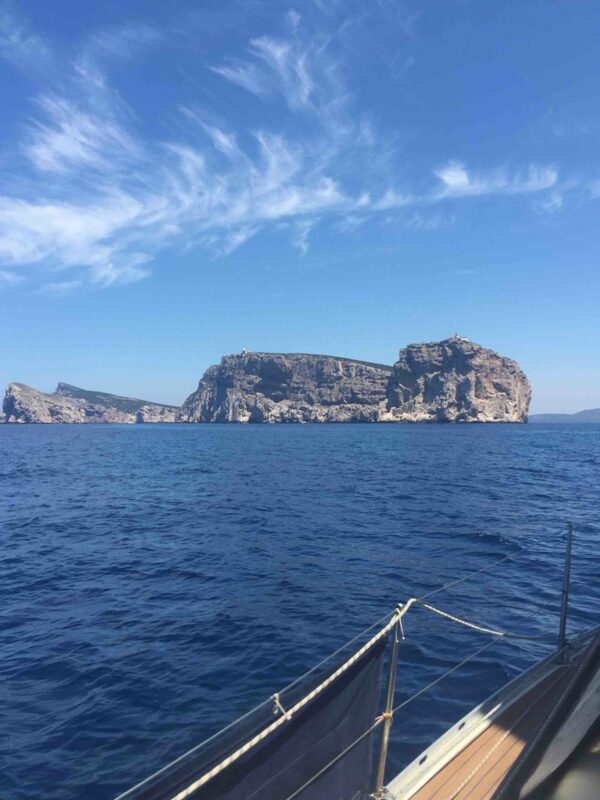 We were aiming for an anchorage just above Alghero. 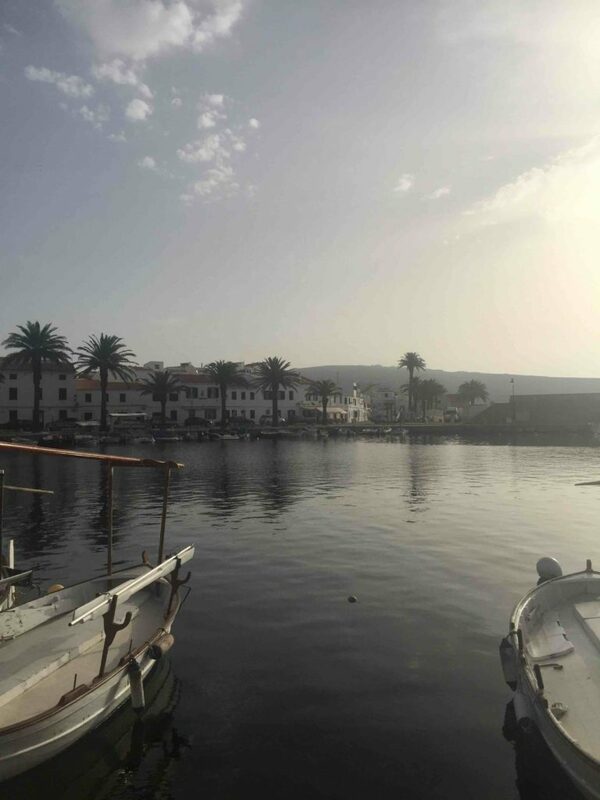 Around 1pm, almost exactly 48 hours after leaving from Menorca, we arrived in Porto Conte – a fairly large bay with several anchoring places. The first location on the lefthand side of the bay didn’t look so appealing and was already quite full. We moved on to the second location which only contained 1 other boat. We soon found out why: the bottom had a lot of weed and it was difficult to get the anchor set. After a few attempts we were set well enough for the coming night, as no strong winds were expected. It was not a place to spend a lot of time so we were aiming to move on the next day. Our friends on Wilma, and Oivind and Susan arrived soon after. Everybody had completed the crossing without major incidents but was too tired to have a big celebration that evening. 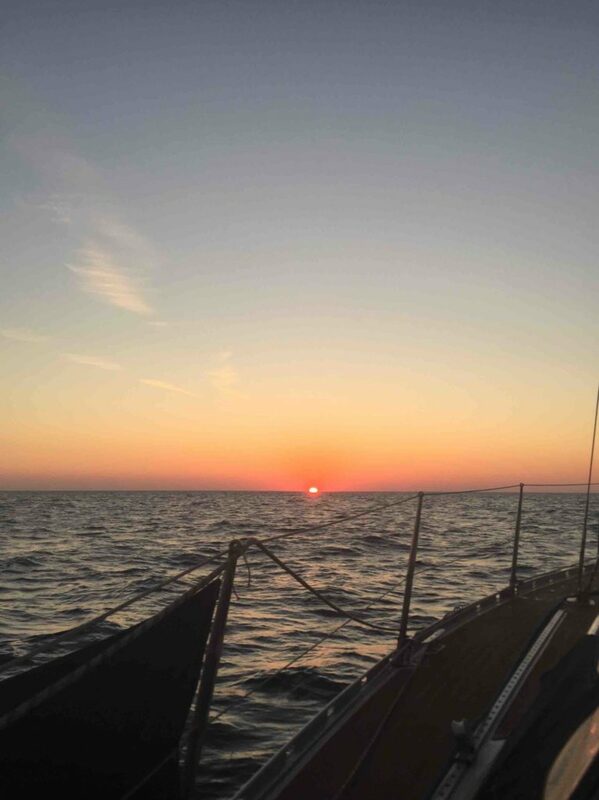 A good night rest at anchor and we were ready to take on Italy. You travels sound exhilarating and fantastic, glad the tooth is better. We are having a ball😀. Thanks for following us. Very cool. Sonce when is he going by Jon again? Am I the only one wanting Oivind and Susan’s story to develop? Been on the edge for the last couple of posts.